DISCLAIMER: Picture above is not my pantry, but I wish it was. I am being forced to eat everything in my house by financial situations. I have a bad habit of buying stuff on sale, stashing it, and never using it. It's deplorable, I know, but I just can't turn down a sale. I'm being forced to be better about that, though, as you will read. Anyway, I moved last month and I broke my arm (old news), so I couldn't work. All my emergency money went to pay for rent and other bills, so I'm pretty broke. I had some food stamp money left on my card, so I thought I would be o.k....then I lost my card, and was told it would be 5 to 7 business days (about 7 to 10 real days) to get a new one. litter, and having to save money out to ride the bus wherever I need to go, I had to figure out just what I had to eat, and how long it would last. I eat too much anyway, and I'm always saying I'm going to cut back and lose weight, so I figure this will be a good time to do that. My cupboard and refrigerator were pretty pathetic. Most of what I had wasn't really healthy, or it needed something to go with it, so I started making a list and putting together filling, if not altogether healthy, meals. I discovered I did not have a lot of protein, save a bag of raw peanuts, so I boiled those and used them as protein for a few days. I had a few boca burgers left, buns and pickles, plus some frozen seasoned potato wedges, so that made two meals. I also discovered I had a box of pancake mix that you can make with water, which I have in the past used to make wraps by making them very thin and cooking them slowly so they toughen up. That's good. I can mix those vegetarian breakfast crumbles and spinach-artichoke dip in the freezer and make wraps. O.K., so that isn't going to last me for 10 days, but I have other options that I can get creative with. If worse comes to worse, I'll eat pasta with butter for a couple of days, or even go on a lemonade fast, since I have a couple of bottles of lemon juice and molasses, and plenty of cayenne pepper. This isn't the first time I have been thankful for my stockpiling tendencies. When I first lost my job three years ago, I immediately applied for food stamps. 3 months later I was running out of stockpiled food, and had to resort to calling the governor's office to get some help with my case. I had never been so happy to have been a food hoarder! I could not believe that my supplies lasted that long, with the addition of an occasional purchase of staples. I wish I had been stockpiling money too, but that's another story. In my new apartment, I don't have a lot of room for stockpiling. I'm trying to learn to buy only what I can eat that week from what is on sale. 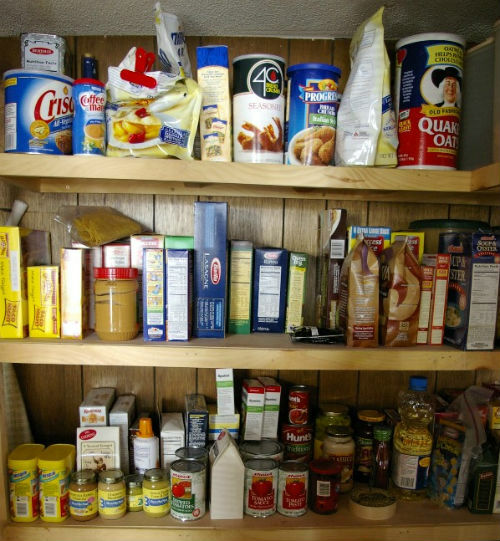 Of course, some sale items are more like staples (like that pancake mix), so there will still be things in the cupboard, but not nearly as much, because frankly, I don't have even half as many cupboards to work with, nor do I have room elsewhere to make a pantry. I'm hard pressed to find a place to stash my hurricane supplies! Hoarding is bad, stockpiling is good. I'll find a way to stash some stuff somehow, even if I have to get rid of something to make room. Where there's a will, there's a way!